Lucy is a 2014 English-language French science fiction action film written and directed by Luc Besson and produced by his wife Virginie Besson-Silla for his company EuropaCorp. The film was shot in Taipei, Paris, and New York City. It stars Scarlett Johansson, Morgan Freeman, Choi Min-sik, and Amr Waked. Johansson portrays the titular character, a woman who gains psychokinetic abilities when a nootropic drug is absorbed into her bloodstream. The film was released on July 25, 2014, and became a box office success, grossing more than $463 million, 11 times the budget of $40 million. It received positive, but also polarizing, critical reviews. Although praise was given for its themes, visuals, and Johansson's performance, a number of critics found the plot nonsensical, especially its focus on the ten percent of the brain myth and resulting abilities. Lucy is a 25-year-old American woman living and studying in Taipei, Taiwan. She is tricked into working as a drug mule by her new boyfriend Richard, whose employer, Mr. Jang, is a Korean mob boss and drug lord. Lucy delivers a briefcase to Mr. Jang supposedly containing paperwork, but it actually contains four packets of CPH4, a highly valuable synthetic drug. After seeing Richard shot and killed, she is captured and a bag of the drug is forcibly sewn into her abdomen and that of three other drug mules who will also transport the drug for sale in Europe. While Lucy is in captivity, one of her captors kicks her in the stomach, breaking the bag and releasing a large quantity of the drug into her system. As a result, she begins acquiring increasingly enhanced physical and mental capabilities, such as telepathy, telekinesis, mental time travel, and the ability not to feel pain. Her personality also changes into a more ruthless and emotionless one. She kills off her captors and escapes. Lucy travels to the nearby Tri-Service General Hospital to get the bag of drugs removed from her abdomen. The bag is successfully removed and Lucy is told by the operating doctor that natural CPH4 is a volatile substance produced in minute quantities by pregnant women during their sixth week of pregnancy to provide fetuses with the energy to develop. Lucy is fortunate to have survived with such a large amount introduced into her body. Sensing her growing physical and mental abilities, Lucy returns to Mr. Jang's hotel, kills his bodyguards, assaults Mr. Jang, and telepathically extracts the locations of the three remaining drug mules from his brain. At her apartment, Lucy begins researching her condition and contacts well-known scientist and Professor Samuel Norman whose research may be the key to saving her. After Lucy speaks with Professor Norman and provides proof of her developed abilities, she flies to Paris and contacts a local police captain, Pierre Del Rio, to help her find the remaining three packets of the drug. During the plane ride, she starts to disintegrate as her cells destabilize from consuming a sip of champagne, which made her body inhospitable for cellular reproduction. Only by consuming more CPH4 is she able to hold off her total disintegration. Her powers continue to grow, leaving her able to telepathically incapacitate armed police and members from the Korean drug gang. With the help of Del Rio, Lucy recovers the drug and hurries to meet Professor Norman. Alongside Professor Norman and his colleagues, she agrees to share everything she now knows after Professor Norman points out that the main point of life is to pass on knowledge, something for which she now possesses an infinite capacity. Jang and the mob also want the drug and a gunfight ensues with the French police. In the professor's lab, Lucy discusses the nature of time and life and how people's humanity distorts their perceptions. She tells the scientists that time is the only true measure of human life and of existence. At her urging, she is intravenously injected with the contents of all three remaining bags of CPH4. Her body begins to change into a bizarre black substance which behaves like nanites, spreading over computers and other electronic objects in the lab, as she transforms these into an unconventionally shaped, next-generation supercomputer that will contain all of her enhanced knowledge of the universe. She then begins a spacetime journey into the past, eventually reaching the oldest discovered ancestor of mankind, implied to be Lucy. She touches fingertips with her, then goes all the way to the beginning of time and witnesses the Big Bang. Meanwhile, back in the lab, after an M136 AT4 anti-tank weapon destroys the door, Jang enters and points a gun at Lucy's head from behind. He shoots, but in the instant before the bullet strikes, Lucy reaches 100% of her cerebral capacity and disappears, moving into the spacetime continuum. Only her clothes, Louboutin shoes, and the black supercomputer are left behind. Del Rio enters and fatally shoots Jang. Professor Norman takes a star-filled black, presumably highly advanced, flash drive offered by the advanced supercomputer, after which the computer disintegrates. Del Rio asks Professor Norman where Lucy is, immediately after which Del Rio's cell phone sounds and he sees a text message: "I am everywhere." With an overhead shot, Lucy's voice is heard stating "Life was given to us a billion years ago. Now you know what to do with it." The role of Lucy called for "an actress who could be believable as extremely vulnerable, as well as superpowered, when her exposure to an illicit substance inadvertently makes her acquire incredible skills." Impressed by Johansson's discipline, Besson considered her for the role, stating that she was immediately precise and professional, and he "enjoyed the way she talked about the film." He said, "She was excited for the right reason, which was the story. At that moment, it was a done deal for me. She was definitely the one." Angelina Jolie is widely reported to have been originally cast as Lucy, and as having dropped out of the role prior to filming. Although Jolie was in "serious talks" with Besson since 2011 to star in his next directorial effort, then-untitled, he stated that she was not his first choice for the role of Lucy. Besson said that Mr. Jang is the "best villain" he scripted since Gary Oldman's character, Norman Stansfield, adding that "Whereas Lucy is the ultimate intelligence, Mr. Jang is the ultimate devil." Besson and his film team "had to go and meet [Choi] in Korea, talk with him and discuss the story. And it was only at the very end that he said, 'Okay, I'm interested, I want to be in.'" Early reviews for the film were positive and mixed, and later generally positive. Lucy was categorized as entertaining and silly, but also polarizing, by critics. On review aggregator website Rotten Tomatoes, it holds a score of 66% based on 217 reviews; the rating average is 6.1/10. The site's critical consensus reads: "Enthusiastic and silly, Lucy powers through the movie's logic gaps with cheesy thrills plus Scarlett Johansson's charm – and mostly succeeds at it." On review aggregator Metacritic, the film has a score of 61 out of 100, based on 45 reviews, indicating "generally favorable reviews". Audiences polled by CinemaScore gave the film a "C+" grade on a scale of A to F. Based on 14 press reviews, French website AlloCiné gave the film an average rating of 2.6 out of 5. The film received a score of 84% on French website Cinémur. ↑ Kroll, Justin (23 May 2014). "Universal Moves Up Scarlett Johansson's 'Lucy' to July 25". Variety. Retrieved 4 June 2014. ↑ Lee, Hsin-Yin (4 April 2014). "French director's new movie helps promote Taipei". Focus Taiwan. Central News Agency. Retrieved 5 April 2014. ↑ "LUCY (15)". Universal Studios. British Board of Film Classification. 12 August 2014. Retrieved 13 August 2014. ↑ "Lucy (2014)". Baseline. Retrieved 27 August 2015 – via The New York Times. 1 2 3 4 "Lucy". Box Office Mojo. Retrieved 4 November 2015. 1 2 3 4 Gettell, Oliver (28 July 2014). "'Lucy': 5 reasons the Scarlett Johansson film ruled the box office". Los Angeles Times. Retrieved 22 August 2014. 1 2 Lombardi, Ken (25 July 2014). ""Lucy," "Hercules" both get strength from critics". CBS News. Retrieved 8 September 2014. 1 2 3 4 Blackburn, Ralph (20 July 2014). "Lucy, Limitless, Transcendence - Why the 'underused brain' is a film-makers' myth". Belfast Telegraph. Retrieved 24 July 2014. 1 2 3 4 5 6 7 8 9 10 "Lucy Production Notes" (PDF). Universal Pictures. Retrieved 11 August 2014. 1 2 3 4 Foundas, Scott (5 August 2014). "Luc Besson Puts His EuropaCorp to the Test With 'Lucy'". Variety. Retrieved 21 August 2014. ↑ Carson, Tom (25 July 2014). "Lucy Gives Scarlett Johansson a Role She Can Kill: Genetic Freak". GQ. Retrieved 26 July 2014. ↑ Corliss, Richard (25 July 2014). "I Love Lucy — and Luc, and Scarlett". Time. Retrieved 8 September 2014. ↑ Serba, John (25 July 2014). "'Lucy' movie review: Scarlett Johannson strong but sci-fi is weak in silly thriller". mlive.com. Retrieved 26 July 2014. ↑ Armitage, Hugh (7 December 2011). "Angelina Jolie in talks for Luc Besson dramatic thriller". Digital Spy. Retrieved 22 August 2014. ↑ Lyons, Margaret (12 June 2011). "Angelina Jolie in Talks for Luc Besson's Next Movie". New York/vulture.com. Retrieved 22 August 2014. ↑ Jagernauth, Kevin (28 July 2014). "Luc Besson's Statement Of Intent For 'Lucy' Compares The Film To '2001,' 'Inception' & 'Leon The Professional'". Indiewire. Retrieved 29 July 2014. 1 2 3 Bodey, Michael (2 August 2014). "Why love Luc Besson's Lucy, with Scarlett Johansson?". The Australian. Retrieved 22 August 2014. ↑ "CNC - publications - la production cinématographique en 2013". www.cnc.fr. 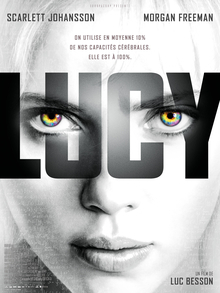 ↑ ""Lucy" : Luc Besson casse sa tirelire pour Scarlett". 1 2 Connelly, Brendon (2 July 2013). "Luc Besson's Sci-Fi Superheroine Movie Lucy Will Spend EuropaCorp's Biggest Budget To Date". Bleeding Cool. Retrieved 24 July 2014. ↑ Keslassy, Elsa (16 July 2013). "Morgan Freeman Set to Topline in 'Lucy'". Variety. Retrieved 24 July 2014. ↑ "Luc Besson tourne discrètement sa superproduction à Étretat" [Luc Besson's blockbuster is filmed discreetly in Étretat]. 76actu (in French). 19 September 2013. Retrieved 24 July 2014. ↑ "Scarlett Johansson spotted shooting film in Taipei". Focus Taiwan. Central News Agency. 21 October 2013. Retrieved 24 July 2014. ↑ "Scarlett Johansson filming for 'Lucy'". Taipei Times. 22 October 2013. Retrieved 24 July 2014. 1 2 Brzeski, Patrick (23 October 2013). "Scarlett Johansson Begins Taiwan Shoot for Luc Besson's 'Lucy,' Causes Media Circus". The Hollywood Reporter. Retrieved 24 July 2014. ↑ "Taipei 101 to be featured in new Luc Besson movie". Focus Taiwan. Central News Agency. 19 October 2013. Retrieved 24 July 2014. ↑ "Universal Pictures and Europacorp's "Lucy" Races into International IMAX® Theaters Starting August 8". PRN Newswire. IMAX Corporation. 8 July 2014. Archived from the original on April 3, 2015. Retrieved 24 July 2014. ↑ "Luc Besson Slams 'Nightmare' Paparazzi That Plagued Scarlett Johansson". MovieFone. 3 November 2013. Retrieved 24 July 2014. 1 2 3 Robertson, Barbara (August 6, 2014). "How VFX Supe Richard Bluff Explored New Approaches for Lucy". studiodaily.com. Access Intelligence, LLC. Retrieved 8 August 2014. ↑ Desowitz, Bill (August 1, 2014). "ILM Gets Trippy with Scarlett Johansson's VFX in Luc Besson's 'Lucy'". IndieWire. Retrieved September 4, 2014. ↑ Giardina, Carolyn (July 30, 2014). "'Lucy:' How VFX House ILM 'Surprised' Luc Besson With the Visuals". The Hollywood Reporter. Retrieved September 4, 2014. ↑ Wolfe, Jennifer (July 28, 2014). "Rodeo FX Helps Create Spectacular Car Chase for 'Lucy'". AWN. Retrieved September 4, 2014. ↑ "Soundtrack For "Lucy," Starring Scarlet Johansson Released Today". Empty Lighthouse Magazine. 22 July 2014. Retrieved 10 August 2014. ↑ "Internet Movie Poster Awards - Lucy Poster". impawards.com. Retrieved August 17, 2014. ↑ "'Dumb & Dumber To' Posters Give Harry & Lloyd the 'Lucy' Treatment". firstshowing.net. August 15, 2014. Retrieved August 17, 2014. ↑ "Dumb and Dumber To' Posters Spoof Scarlett Johansson's 'Lucy'". Variety.com. August 16, 2014. Retrieved August 17, 2014. ↑ "Scarlett Johansson Goes Superhuman in 'Lucy' Trailer (VIDEO)". Variety. 2 April 2014. Retrieved 24 July 2014. ↑ Sacks, Ethan (2 April 2014). "'Lucy' trailer released: Scarlett Johansson stars as super-powered drug mule". Daily News. Retrieved 26 July 2014. ↑ Palladino, Valentina (2 April 2014). "Scarlett Johansson is a telekinetic superhuman in the trailer for 'Lucy'". The Verge. Retrieved 26 July 2014. ↑ Towers, Andrea (2 April 2014). "Scarlett Johansson becomes superpowered in new 'Lucy' trailer". Entertainment Weekly. Retrieved 26 July 2014. ↑ Davis, Lauren (2 April 2014). "Scarlett Johansson Is A Superpowered Genius In The First Lucy Trailer". io9. Retrieved 25 July 2014. ↑ Luxford, James (4 April 2014). "Lucy trailer: another high for Scarlett Johansson?". The Guardian. Retrieved 13 March 2015. ↑ Rosenfield, Kat (2014). "'Lucy': The Reviews Are In". MTV.com. Archived from the original on 2014-07-30. Retrieved 26 July 2014. ↑ Cheng, Sabine; Kao, Evelyn (10 July 2014). "Luc Besson explains why he chose Taipei to film 'Lucy'". Focus Taiwan. Central News Agency. Retrieved 16 July 2014. ↑ Christian Jarrett, Great Myths of the Brain, Wiley-Blackstone Press, 2014, pp51-55. ↑ "Theater Counts for Week 30 of 2014". Box Office Mojo. Retrieved 26 July 2014. 1 2 3 4 McClintock, Pamela (26 July 2014). "Box Office: 'Lucy' Wows With $17.1M Friday; 'Hercules' Distant No. 2". The Hollywood Reporter. Retrieved 26 July 2014. 1 2 McNary, Dave (25 July 2014). "'Lucy' Beating Up 'Hercules' at Friday Box Office". Variety. Retrieved 26 July 2014. 1 2 3 "Lucy: Week 1 of a global success story". Unifrance. 8 August 2014. Retrieved 23 August 2014. ↑ "Lucy' draws crowds on opening day". Taipei Times. 21 August 2014. Retrieved 23 August 2014. 1 2 Ma, Kevin (22 August 2014). "Lucy sizzles at Taiwan box office". filmbiz.asia. Retrieved 23 August 2014. 1 2 3 4 Subers, Ray (27 July 2014). "Weekend Report: 'Lucy' Wins Brain vs. Brawn Battle". Box Office Mojo. Retrieved 29 July 2014. ↑ Cunningham, Todd (27 July 2014). "Scarlett Johansson's 'Lucy' Hammers 'Hercules' and The Rock at Box Office". The Wrap. Retrieved July 29, 2014. 1 2 3 4 Sims, David (25 July 2014). "Is 'Lucy' Being Criticized as Dumb Because It's About Being Smart?". The Wire. Retrieved 25 July 2014. ↑ Macatee, Rebecca (25 July 2014). "Lucy Review Roundup: Do Critics Like Superhuman Scarlett Johansson?". E! News. Retrieved 8 September 2014. ↑ Stiles, Nancy (27 July 2014). ""Lucy" Killed "Hercules" at the Box Office". Complex.com. Retrieved 28 July 2014. ↑ "Today's Big Releases: Hercules, Lucy, 22 Jump Street". NDTV. 1 August 2014. Retrieved 8 September 2014. ↑ Perez, Rodrigo (27 July 2014). "Box-Office: Scarlett Johansson's 'Lucy' Beauty Outperforms Dwayne Johnson's 'Hercules' Brawn". Indiewire. Retrieved 28 July 2014. ↑ Beifuss, John (25 July 2014). "Movie Review: ScarJo is a SuperBeing in action thriller 'Lucy'". Memphis Commercial Appeal. Retrieved 25 July 2014. ↑ "Lucy". Rotten Tomatoes. Retrieved 6 August 2018. ↑ "Lucy". Metacritic. Retrieved 25 July 2014. ↑ "Lucy". AlloCiné. 2014. Retrieved 13 January 2019. ↑ "Lucy". Cinémur. 2014. Retrieved 28 August 2014. 1 2 3 4 5 "Lucy". AlloCiné. 2014. Retrieved 28 August 2014. 1 2 3 4 5 Chang, Justin (23 July 2014). "Film Review: 'Lucy'". Variety. Retrieved 23 July 2014. 1 2 Hoffman, Jordan (23 July 2014). "Lucy: mindless and mixed up, but propulsive and fun – first look review". The Guardian. Retrieved 23 July 2014. ↑ Vejvoda, Jim (23 July 2014). "Lucy Review". IGN. Retrieved 24 July 2014. ↑ LaSalle, Mick (24 July 2014). "'Lucy' review: Straight-up action with serious brains". San Francisco Chronicle. Retrieved 24 July 2014. 1 2 3 4 DeFore, John (23 July 2014). "'Lucy': Film Review". The Hollywood Reporter. Retrieved 23 July 2014. ↑ Nicholson, Amy (24 July 2014). "Lucy". LA Weekly. Retrieved 24 July 2014. 1 2 3 Prigge, Matt (23 July 2014). "Review: 'Lucy,' with Scarlett Johansson, is stupid, smart and awesome". Metro New York. Retrieved 24 July 2014. ↑ Phillips, Michael (24 July 2014). "Johannson's limitless Lucy starts well but..." Chicago Tribune. Archived from the original on July 24, 2014. Retrieved 24 July 2014. 1 2 Burr, Ty (24 July 2014). "In 'Lucy,' a heroine's brain fires on all cylinders". The Boston Globe. Retrieved 24 July 2014. ↑ Collin, Robbie (August 12, 2014). "Lucy, review: 'everything Scarlett Johansson does is worth watching'". The Daily Telegraph. Retrieved August 14, 2014. ↑ Seitz, Matt Zoller (25 July 2014). "Lucy". RogerEbert.com. Retrieved 25 July 2014. ↑ Toro, Gabe (23 July 2014). "Review: Luc Besson's 'Lucy' Starring Scarlet Johansson And Morgan Freeman". Indiewire. Retrieved 25 July 2014. ↑ Jordan, Smith (24 July 2014). "Is 'Lucy' the Most Powerful Film Character Ever?". Hollywood.com. Retrieved 26 July 2014. ↑ Finke, Nikke (26 July 2014). "Weekend Box Office: #1 'Lucy' $44.1M". NikkeFinke.com. Archived from the original on 27 July 2014. ↑ "Lucy". Retrieved 7 August 2014. ↑ Radish, Christina (April 24, 2014). "Director Luc Besson Talks LUCY, a Possible Sequel". Collider.com. Retrieved 26 July 2014. ↑ Coonan, Clifford (August 20, 2014). "Luc Besson Says 'Lucy' Sequel Unlikely". hollywoodreporter.com. The Hollywood Reporter. Retrieved August 23, 2014. ↑ "'Lucy' sequel unlikely: director Luc Besson - Entertainment & Sports - FOCUS TAIWAN - CNA ENGLISH NEWS". ↑ "Lucy 2 Confirmed To Be In Development". Comicbook.com. ↑ "Luc Besson's 'Lucy 2' is Still Happening, And It's Thanks to 'Valerian'". /Film. October 2, 2017. ↑ "The LOCUS Index to SF Awards". Archived from the original on June 18, 2015.